Today You will Discover what’s Causing your Itchy Throat! It is normal to get a trickle in our throat from time to time, and this is considered as a minor irritation that passes with time. Usually, this infection is normally associated with infections such as cold and sometimes considered as part of having a common cold. However, when the cold becomes persistent and doesn’t go away after a few days, this condition may be distressing especially if makes you lose sleep, lose concentration, or makes the throat sore because of excessive coughing. So What is the Causes Itchy Throat? For this reason, it is crucial to get to know the cause of the itch throat so that you can know which best medication to use is. The best thing about this condition is that is can be managed by use of simple nonprescription drugs as well as other home remedies. Allergic rhinitis is also referred as hay fever. This is a major cause of throat irritation as it affects as many as 40-60 million people in the USA annually(1). The Allergic rhinitis occurs when our body overacts with an otherwise substance. This cause the body to release a chemical referred as the histamine that is responsible for causing overreactions. The common trigger of this condition includes things such as dander, pollen; dust as well as other irritants like exhaust fumes and cigarette smoke. Another main cause of an itchy throat is the allergies to some foods. Allergic food reactions occur when your body reacts to some certain foods which when eaten they tend to hurt the body. The reaction often occurs in minutes or after some hours of eating the trigger food. The allergy can be something from mild with some symptoms stopping with an itchy mouth or throat while others may be life-threatening. The common triggers of the food allergies(2)include eggs, peanut, shellfish, as well as wheat. A lot of individuals are affected by allergies to various drugs including antibiotics and penicillin. The cruelty of the allergy will vary from mild to serious which life is threatening. The symptom of allergies that occurs due to medication includes an itchy throat that begins shortly after consuming the new medication. As mentioned, the symptoms may be mild or severe. You should visit your doctor to recommend an alternative medication when you notice any negative reaction with your body. Some of the bacterial infections such as tonsillitis often begin with a scratchy throat. This condition worse and becomes a more relentless throat which is painful and uncomfortable. We also have some virus such as the flu or common cold virus that is responsible for causing a scratchy throat. In the event that you are just suffering from a cold, the irritated throat often doesn’t go past being a mild sore. However, if you have a flu-infection your throat soreness may become more relentless and most of the time accompanied by body aches, fever as well as chest discomfort. When the stomach acid get into the food pipe, you develop an itchy throat condition that is often referred as heartburn. When you have unceasing acid reflux, you are likely to suffer from an itchy throat. When you are suffering from acid reflux, you are likely to have more than just an itchy throat. Dehydration is a condition that develops when your body loses more water that it gets. This is common after exercise, under hot and windy weather or when you have an illness. When suffering from dehydration. Then you are likely to have a dry mouth, which is a condition where your throat and mouth doesn’t have sufficient saliva. Well, we mentioned about drug allergies that results when you take a specific medication. Well, some may view it, as the same thing as drug side effect but this is very different. This is just to set the record straight, not all the medications that cause the dry mouth and itchy, mouth does so because of allergic reactions. Individuals that are taking the ACE inhibitor for hypertension should know the ACE inhibitors are also responsible for causing a scratchy throat as well as a dry cough. Various infections are also common causes of an itchy throat. These infections are caused by various microorganisms including virus, bacteria, and fungi. They often affect any individual healthy or not especially those with a weak immune system. As mentioned, allergies are also main causes of the itchy throat. However, allergies don’t only occur from food and drugs. We also have others that occur when we breathe contaminated air. This may be because of excess dust, pollen, or even pet hair. When the itchy throat is because of allergies, it is accompanied by shortness of breath, runny nose, and watery eyes. Inhalation of the pollutants, as well as chemical irritants, also causes an itchy throat. 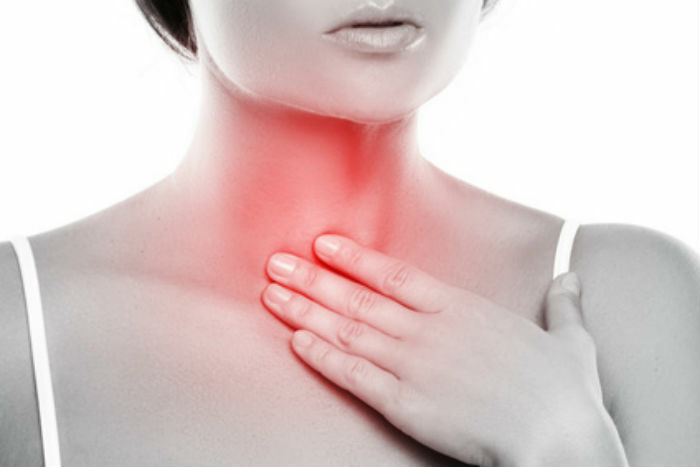 Some of the common things that irritate the throat include both first and second-hand smoking. When you use your vocals excessively, it also results in an itchy throat. This often occurs when you sing or yell for a long period. When your throat becomes excessively dry, it can also lead to irritation. Some of the main causes of dry throat include cold windy air, breathing through the mouth, excessive indoor heating, taking too much of alcohol, caffeine or excessive smoking. When a foreign material gets in the throat, for instance, a piece of glass or bone gets in the throat, it can also lead to a lot of irritation as well as itchiness. Some of the things you can do to dislodge it includes gargling salt or coughing up the object. We also have various disorders that affect other organs that can often result in an itchy throat. These include bronchitis, sinusitis, tuberculosis, pneumonia, cystic fibrosis, and lung parasites. Neck disorders can also make you have an itchy throat. Some of the neck disorders that contribute to an itchy throat include an enlarged thyroid, abscess, enlarged lymph nodes, or even a tumor. It is important to note that most of the time, scratchy throat often come with other symptoms. In addition, these symptoms vary depends on the primary cause. For instance, when you are suffering from allergic rhinitis, itchy throat symptom may also be accompanied by the following symptoms. As mentioned earlier, Food and drug allergies also cause itchy throat. However, this condition is often accompanied by the following symptoms. These symptoms vary from mild to serious one that needs immediate medical intervention. Below are some of the symptoms that occur hand by hand with itchy throat due to food and drug allergies. It is good to note that it is hard to distinguish the cause of an irritated throat cause. For instance, an itchy throat that arise as a result of allergic rhinitis and the one caused by food or drug allergy is accompanied by sneezing or nasal congestion. However, if this condition is because of a serious illness, it often occurs for a short period and accompanied by these symptoms. The medical treatment option will depend on the underlying cause of the throat itchiness. Some of the common treatment that your doctor can recommend dealing with this condition. Includes cough medicine, painkiller antihistamines, corticosteroids, antifungal, as well as antibiotics. It is important to know that some of the treatments may lead to some side effects. For this reason, it is always advisable to use the medication as directed by your doctor. Besides medications, there are various home remedies that you can use to try to ease an irritated throat. To begin with, you are advised to drink water because the cause may be simply because your throat is dry. Besides, here are some of the other home remedies that can help ease an itchy throat. So, what can you do to prevent an itchy throat? Well, prevention has always been a better alternative than cure. Below are some of the things that you can do to prevent having an itchy throat in the first place. To begin with, you should avoid alcohol and caffeine. Drinking excessive of caffeine and alcohol can lead to dry throat irritating. Also, individuals can minimize the threat of an irritated throat by doing the following. Well, it is not necessary to go to a doctor everytime you need to diagnose an itchy throat. In fact, this condition can be easily managed through home remedy most of the time. However, if you find yourself having the symptoms for 7-10 days or more with the condition worsening, you may need to visit a doctor. You should also visit a physician when the itchy throat is accompanied by any of the symptoms below. As you can see, many conditions can cause an itchy throat. However, the best thing about this condition is that you can manage it without going to a doctor. Using any of the above or a combination of the various home remedies can help you get rid of the itchy throat effectively. Besides, we have also listed some of the ways to prevent an itchy throat in the first place. However, it is always recommended to visit a doctor if the condition doesn’t improve when you have used the home remedy. All the best!